Comey appeared before the Homeland Security and Government Affairs Committee, his first congressional testimony since taking office in September. He said that while terrorism remains the FBI's top priority, cyber-security could soon top that. "We anticipate that in the future, resources devoted to cyber-based threats will equal or even eclipse the resources devoted to non-cyber based terrorist threats," he said. 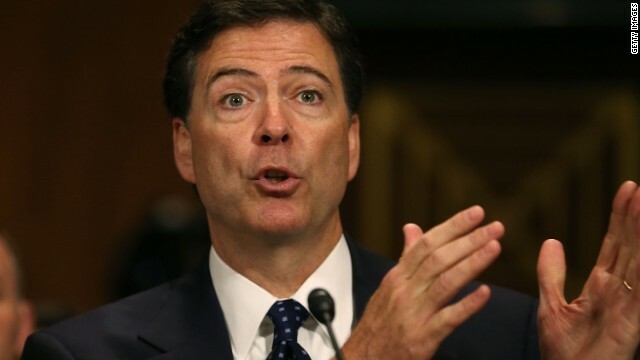 Senators tried to draw Comey and his fellow panel members, Rand Beers, acting secretary of the Homeland Security Department, and Matthew Olsen, director of the National Counterterrorism Center, into taking sides on the ongoing partisan divide over the Guantanamo prison, which President Barack Obama has ordered closed. Ayotte expressed frustration that the Obama administration's practice of interrogating terror suspects on Navy ships, as happened after the capture of alleged al Qaeda operative Abu Anas al Libi in Libya in October, was a poor substitute for Guantanamo. She pressed Comey to say that longer periods of interrogation are better for law enforcement. He agreed. Left unsaid: al Libi was brought to the United States after a week in part because he stopped cooperating and officials wanted to provide treatment for pre-existing Hepatitis, according to U.S. law enforcement officials. Accused playing a role in the 1998 U.S. Embassy bombings in Kenya and Tanzania, he has pleaded not guilty to terrorism charges in federal court in New York. Sen. Carl Levin, D-Michigan, rebutted the questioning from Ayotte and others by getting Comey to discuss the many terrorism trials that have been safely handled by civilian courts. Beers and Comey said they knew of no particular danger posed by housing terrorists in maximum security federal prisons. Comey tried to avoid the political fighting over Benghazi. The FBI director said he didn't object to members of Congress interviewing U.S. survivors of the Benghazi attack, as requested by some lawmakers. He said he was unable, in a public hearing, to discuss related charges filed under seal. As first reported by CNN, the Justice Department has filed charges against suspects, including alleged Libyan militant Ahmed Abu Khattala, but hasn't yet made them public. CNN has also reported that the United States has prepared plans to try to capture Khattala and other suspects, but that operation was been scuttled in the wake of the al Libi capture. A U.S. law enforcement official has told CNN that a planned operation in Benghazi, a stronghold of hostile militant forces, was always viewed as more complicated than the al Libi operation in Tripoli, which is under greater Libyan government control. Ok......don't let one Hillary Clinton stop you. Almost there guys, almost enough evidence to put barak on scene leading the charge against the compound. I am pretty sure another 79 hearings and strutting around repeating Benghazi for another 7 months will be key to getting that link. We all know it was the president that planned, bankrolled, and was on the ground executing this attack against a hand full of americans, we just need a few thousand hours more on the tax payers bill to prove it!! Yes, make light of the situation instead of calling for all evidence to be presented so we can move forward, havent you heard, why do you care if you have nothing to hide? "FBI arrests entire Benghazi population and all ethnic tribes fighting for political power in Libya because important Americans happen to be in the wrong place at the wrong time". Well put, Portland. How so very true, too! Had Bengazi, the IRS singling out political 'undersirables', the NSA spying on allies, and government eavesdropping on reporters happen on Bush's watch, the press would've screamed impeachment, and rightfully so. While young during Watergate, i studied it, and what's happening today makes Nixon look like just another one of today's politicians having a bad day at the office. Where is the outrage at the erosion of our principles? Don't get apathetic just because its 'your guy' in the office now because the precedent is now set: it'll turn against us, the American citizen, no matter who's in office. We truly deserve the leadership we have. As always, Thank you, American voter. No they wouldn't. Because when the facts become known it's a "Me an Han Ne da" situation. Like saying, "never mind." They are phony crisis. The IRS probed like they're supposed to probe, however intrusive they may become. Benghazi will be snuffed as a CIA operation to secure shoulder fired ground-to-air missiles; or to get AQ #1 Zawahiri (he loves to be close to his Egypt roots in the Muslim brotherhood). This Juanito post makes one big assumption: there is NO problem with voting in the USA. ..and we thank you for letting us vote for President Obama..PS nixon broke the law...you idiot..
Nixon covered up what happened, that is the exact same thing that they are trying to determine with Pres. Obama, you should want transparency if you do not feel there is something to hide. LONG LIVE THE FOUR DEAD OF BENGHAZI !! WE WILL NEVER, EVER FORGET THOSE LEFT BEHIND !!! 2. The film maker of the YouTube has already been captured and put in jail. The President called it an act of terror the next day. Secretary Clinton called it an ugly act of terror. Ambassador Rice accurately described the perpetrators as being well-armed extremist militants and they were investigation the depth of links to al Qaeda. Intelligence reports indicated that the militants acted spontaneously in response to the video and there is no evidence of advanced planning beyond the hours before the attack. The link between the attacks and the anti-Islam propaganda video did not originate with the White House. Multiple intelligence reports, eyewitness accounts, statements from Libyan officials, and news reports - including interviews with the armed militants and unarmed protesters at the scene - had them taking action in response to the video. These reporters and witnesses have not retracted these accounts and the video was conclusively linked to protests, riots and attacks on more than 50 US facilities in more than 20 nations. Nevertheless, the President, Secretary Clinton and other Administration officials all declared that it made no difference what the motives of the attacking militants were - there was no excuse, no justification for the violence against our people. None. The filmmaker was out on probation for prior convictions related to bank fraud and cooking meth. He went back to jail for parole violations and has since been released. Hey, Jim; how's the Kool-Aid? If we ever get the truth about Benghazi, it will be in spite of this Administration's efforts. not because of them. A bigger bunch of liars has never occupied so many high offices. Bush & Co disgusted me, and Obama & Cronies Unlimited is worse by orders of magnitude. I think that the FBI has bigger fish to fry than this, considering those who constantly rip off Medicare, the human traffickers and the drug dealers in this country. We need to just pull all of our diplomats as well as our private citizens out of Libya for the time being. In fact, we should never have toppled the Qaddaffy regime there and put these self styled "liberators" in office! WE WILL NEVER FORGET THOSE LEFT BEHIND !! LONG LIVE THE FOUR DEAD OF BENGHAZI !!! One simple look at the FBI priorities will show anyone that federal law enforcement do not follow them.